Gutsy Paola Calciori, an example of middle essence transformation was a pharmacist turned mostarda maker from Italy who revives her nona's recipes. The saying dates back to Geoffrey Chaucer, medieval author of the Cantebury Tales. Similarly, the late fourteenth century French proverb, "Qui onques rien n'enprist riens n'achieva," (He who never undertook anything never achieved anything), could be the battle cry of many food artisans, especially those on a second career, which is an increasingly common occurrence. Those who renew old practices often have fascinating backstories. Thanks to the global marketplace, Forever Cheese has become a hub for the creative offerings from independent makers of Mediterranean cheese and accompaniments from Italy, Spain, Portugal and Croatia. Consumers are drawn to artisan products from yearnings for an authentic life consistent with the yearnings of those who are called to produce such items. Embracing a more genuine way to be in the world was evident in the quality and presentation of every item. Attention to details were impressive, from decorative labels adorning the exterior to the quality ingredients contained within. Holding high standards for what one ingests draws someone to fine foods for starters. In turn this attitude supports and continues the values of a living tradition. A way of life which at one time may have been born out of survival, is now about honoring a process, and not about short cuts or cutting corners. Rooted in the past and perfected in the present, traditional recipes are passed from generation to generation because they are worth preserving and refining. Before indulging in a cheese and accompaniments course with our compatriots in artist colony and idea incubator, Marfa, Texas, we attempted a sunset hike on the Overlook Trail, part of the innovative Mimm's cattle ranch open to the public. A polite cowboy stopped our progress, alerted us to the fact he could not let us in for another week, as it was calving season. Surely we did not want to face down a mother cow who had just given birth and was likely protective of her newborn. Turned out it was kidding season for goats too, according to our fellow indulger in Forever Cheese, Ryan Paradiso. A former semi-pro cyclist, he is now one of the men behind Marfa Maid. We returned from the walk to greet in style our New York City pals coming off a road trip to Big Bend National Park. The cheese course as 'Everyday Luxe' has been something of a mystery to clear up. Like many United States citizens, I did not grow up with an awareness of cheese as a course onto itself. The 1970's was the first time I recalled being introduced to kirsch flavored cheese and Boursin, beyond the cream cheese and Muenster slices of my youth. Before a meal, gems of the dairy could be treated as an hors d'ouevres, small bites to whet the appetite, but not to go overboard, as easy as that can be. At the other end of the meal, cheese in all its glory would be saved for the end accompanied by a salad after a smaller main course. When cheese and its accoutrements is served last it might usurp or encompass desert. With all these courses, each segment should be smaller, so that one does not to over-do and ruin a good time. Remember too much of a good thing is still too much. Shout outs to accompaniments first, before discussing the cheese. MOSTARDA AND MOJO PICON tie for the best new-again comestible. The beautiful thing about being surprised, is you do not know where it will come from. The mostarda was a previously undiscovered accompaniment that I now want to crow about from every rooftop. It was such a remarkable and unusual stand out, like nothing I had ever tasted before. Former pharmacist Ms. Calciori looked to the recipe book from her grandmother in Emilia Romagna, an apex of Italy's gastronomic prowess. Paola turns out smashing successes of chunky fruit jellies with a kick, derived from being finished with a few drops of mustard essence. Celebrity Basque chef Mikel Trevino de Luis presents Mojo Picon a typical condiment of the Canary Islands, his place to unplug, play and create his signature offerings. Another distinctive flavoring paste I could spew volumes about was Mojo Picon, a non-parsley chimichurri with pepper, almonds, oil and spices typically found in the Canary Islands, off of Spain. Whole wheels of cheese are majestic. Watching these beauties dwindle into stubs as they are shared with hungry for novelty seeking Marfans is too. Fruits, nuts, breads, crackers, wine and cheese are natural pairings. We brought Fuyu persimmons, the ones like an apple, from our garden in Los Angeles. To this we added dried apricots, and fresh pomegranates, pears and actual apples. Two whole wheels of award winning cheeses wrapped in raffia from Spain, and one from Italy arrived in its own chic pouch. Delivered in a snazzy reusable carry case for subsequent picnics, the ice packs were wrapped in butcher paper which kept everything perfectly dry yet cold. It was a smashing solution to deliver something for a 2000 mile journey from Queens, New York, where Forever Cheese is located, having come across the ocean a continent away. The fact this parcel of goodness arrived in one piece, nothing broken to a remote part of the west Texas, Chihuahan high desert, was a minor miracle. Shout out to Mr. Paradiso for identifying all of the cheeses without peeking the list. 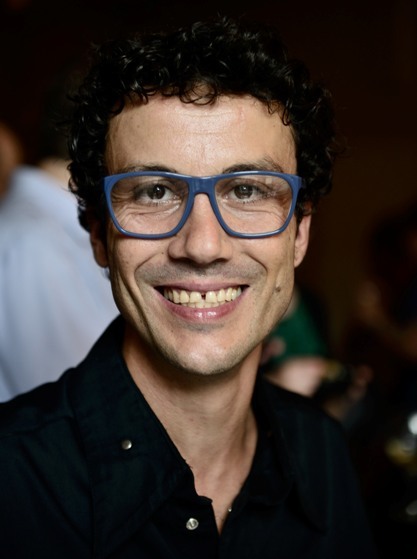 Oriol de Montbru with a pale blue and yellow rind, a work of art itself, was made from buffalo milk on a family farm outside of Barcelona. This animal was non-existent in Spain until the son of the cheese maker (seen below) had the idea to import a herd from northern Italy and relocate them to a nearby nature preserve in Catalonia, a fiercely independent state which shares its land border with Spain. 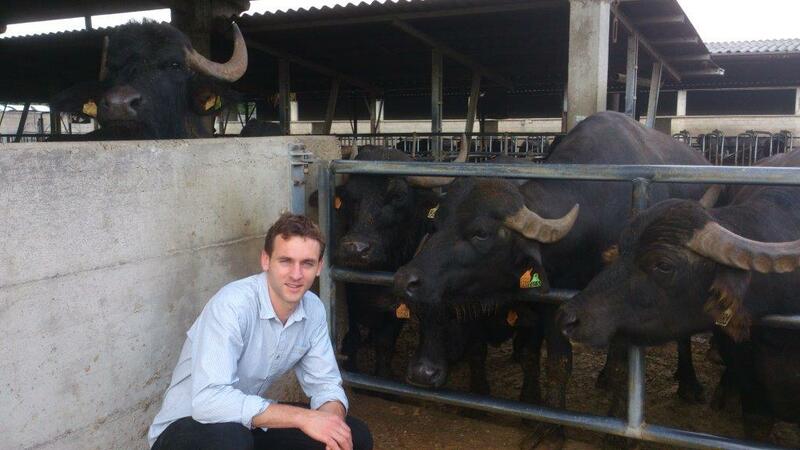 Oriol of Oriol de Montbru in Catalonia surrounded by his beloved Italian buffalo. Pungent, pleasant, and a bit more tart, Cheese Sarro di Cabra, a goat cheese, is from the same maker located in Catalonia, where Pablo Picasso was born. Italian Pecorino di Fossa was sassy and wild. It comes ensconced in a snazzy cloth packet, I now use to hold hand creams. The great story behind this cheese was that it was discovered almost a thousand years ago by accident. Farmers hid their cheeses, along with other treasures, in caves during the Saracen pirate raids. Our cheese had been dug up a few weeks before, which was exciting onto itself, during a festival honoring the intellectual St. Caterina of Siena. Fossa Pecorino newly retrieved from the cave underneath the wooden cover. I made a recipe for bucattini with pecorino and pasta water sauce called Cacio E Pepi. The beauty of this dish was the improvisational nature of it. I added cherry tomatoes thrown into cook with the pasta the last three minutes, pickled garlic, red pepper flakes and mixed greens to the cheese and oil mixture to everyone's delight. Creamed spinach went from pleasantly bland to new heights of perfection with pecorino included. Spanish Cocktail Nut mix, you must have at least 2 bags at a time. One was for home and one for the car: crunchy fava beans, chickpeas, corn kernels and almonds. Oro Liquido, made from Marcona almond butter beyond the beyond reaching into the nooks and crannies of a toasted English muffin with Lambrusco (picnic wine) jelly also made by Ms.Calciori, of mostarda fame. Piedra de Luna means moon stones and were named thus for their shape. Dark chocolate and cacoa dusted cashew nuts were divine. Raw Sunflower Honey, less is more and the color of sunshine. Taralli round crackers eaten all over Puglia, the bottom of the boot of Italy. The adventurous gourmet and traveler find certain commonalities. There will always be that wistful note of not having enough time to explore all there is to see and do, or eat. Something untasted, to return to for the next engagement and held back in reserve. For instance, the toasted Roman hazelnuts looked amazing as did the Tortas de Aceite with coffee in the morning. The Olive Oil Crackers Valencia, and the Toketti di Pane Carasau from Sardinia, as well as fig cakes are going to be sampled the next time.